While it is important for children to learn about religion, they should not be schooled in any particular faith. Although organised religion is on the decline in Belgium, Catholicism is everywhere. As every parents knows, finding the right school for your child is a challenge. This challenge is multiplied, or at the very least repeated, for families who move frequently. After a couple of years in Tunisia, where our son went to an international French school, we recently moved back to Belgium. Although Iskander has been going to a local school for less than a month, he has already adjusted and is enjoying himself immensely, despite our worries that the switch in the language of instruction might cause him difficulty. The speed with which Iskander has integrated is, no doubt, due to the fact that our polyglot son has already moved countries a number of times during his short life, and thanks to the warm welcome with which the school has greeted him. The school our son is attending has much to recommend it. Not only is it about 150m from our front door, it is reputed to be one of the best schools in town, while its traditional reputation for strictness seems to be a thing of the past. My main reservation, albeit a modest one, is that this school is Catholic, Jesuit to be precise. My objection is not religious, as I am an atheist, but intellectual. As a non-believer and dedicated secularist, I am troubled by the idea of my child attending a school that associates itself, no matter how loosely, with a particular faith. Luckily, in contemporary Belgium, these establishments are a lot less Catholic than the pope – even if some conservatives do not regard the Jesuit Pope Francis to be terribly Catholic. In primary school, my son will learn some Biblical stories, which are complemented by instruction in general ethics and information about other religions. Rebranded as ‘Dialogue Schools’, Belgian Catholic schools generally welcome pupils of all religions and none – and the diversity of the children running around the playground of my son’s school is testament to that. This shift away from traditional Catholic instruction has provoked the ire of the dwindling ranks of conservative Christians. But rather than being a sign of multicultural political correctness designed to appease Muslims and minorities, it is actually sign of, unlike in America or many parts of Eastern Europe, Belgian society’s drift away from organised religion. This is visible, for example, in all the empty churches. 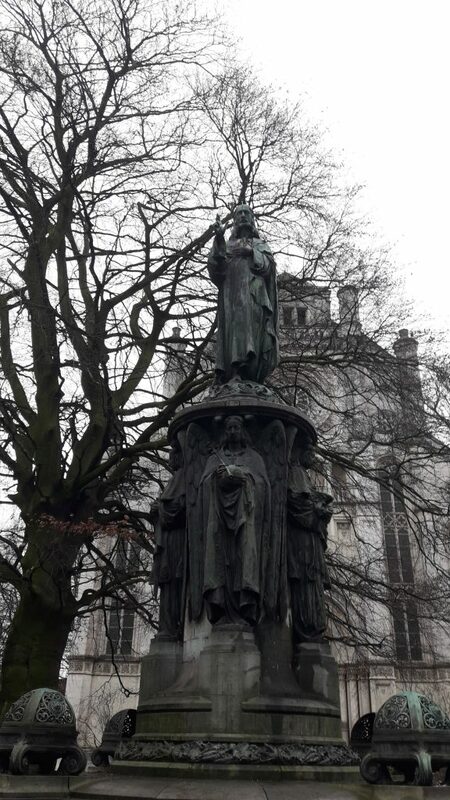 In the medieval centre of picturesque Ghent, where I live, the magnificent and majestic cathedrals and churches are mostly devoid of worshippers and have become more museums than temples. Quite a few churches have been closed down, decommissioned or repurposed. This explains why secularism has finally got the upper hand, even at the heart of Catholic education, which, nonetheless, remains powerful due to this legacy. Since the establishment of the Belgian state, anti-clerical liberals and progressives have opposed the church’s involvement in secular education and the generous subsidies it has traditionally received from the state to do so. Although the largest network of schools in the country remains affiliated to the church, it now does so without much in the way of Catholicism. Whereas my father-in-law’s generation were forced to go to church every day and were often taught by monks and nuns, the chapel at my son’s school has been converted into a social space for kids with a large bicycle shed. That does not mean that religion is dead or on its way out. Although very few Belgians practise their religion, many are culturally Christian. This has involved not only the secularisation and commercialisation of religious feasts, especially Christmas and Saint Nicholas or Sinterklaas, but also the apparently inexplicable spectacle of parents who never go to church and may even be unbelievers but still baptise their children and put them through the main Catholic rites, such as first communion and confirmation. This cultural Christianity, also known as ‘tradition’ and ‘family values’ is especially prevalent in conservative circles. This hardwired nature of Christianity helps explain how it is that many of the people who vocally support the banning of religious symbols in schools see only hijabs and kippahs (yarmulkes) but are blind to the crosses and other Christian iconography in state-funded Catholic schools, including a bust of the Virgin Mary in my son’s class. When a situation like this is well-intentioned, a sign of the messy evolutions and compromises that a changing society goes through, then one can sympathise. However, when the discourse of religious neutrality is used to stigmatise, marginalise and exclude minorities, it is an entirely other question. The far right, for example, is strident in its opposition to the headscarf and the teaching of Islam, even in private Islamic schools, yet has no problem with Christian symbols in schools or the fact that Catholic schools are the dominant form of schools in the country, receiving generous government subsidies. That said, the situation of neutrality is generally worse in many Arab and Muslim countries, where, interestingly, the first modern schools were often established by churches and Christian missionaries. In the most conservative countries, such as the Gulf region, religion makes up a substantial and significant component of the curriculum, and is taught rigidly, dogmatically and conservatively. In my native Egypt, there are secular schools and religious schools connected to al-Azhar and the various churches. As a sign of the relative importance of religion, even secular schools in Egypt probably provide more explicit and less universalist religious instruction than Catholic schools in Belgium, although Muslim and Christian children receive instruction in their own religion. In contrast, religious education in Tunisia is more universalist and philosophical and places emphasis on questions of tolerance and acceptance of other faiths and world-views. However, this does not go far enough for some Tunisian reformers. For example, at a recent conference I attended on civic education in the Arab world, the prominent Tunisian philosopher Youssef Seddik argued, to much dispute and disagreement from delegates from other countries, that not only did religious instruction need to be radically reformed, there was no place for it until the latter stages of secondary education, when young people are old enough to analyse critically and understand what they are learning. Given it social significance, I think schoolchildren should learn about religion (its history, culture and social role), and other alternative philosophical frameworks, but not be taught to adhere to a specific religion. Schools should be places where children are taught how to use their minds freely and critically to seek out truth rather than forced to accept mindlessly an orthodox or dogmatic “truth”. We need less faith education and more faith in our children. This article was first published by The New Arab on 24 January 2019.